Our essential guide to the latest games on iOS and Android platforms. It's been rather dry in the App Store lately, so we were happy to see all the new games to play. On that note, take a look at our app preview to see what's new and exciting for iPhone and Android platforms. World of Tanks goes mobile, with over 90 iconic tanks from Germany, the United States and the USSR. Improve your tank's performance with modules, equipment and consumables using Wargaming.net's advanced progression system. Manage your crew to get the most out of your tank with the ability to choose four different tank classes (light, medium, heavy and tank destroyers). Wotblitz incorporates strategic 7v7 PvP online multiplayer gameplay with 8 unique battle arenas (deserts, towns, industrial areas - all inspired by real-life locations) to deliver a realistic tank battle experience. Using real-life physics to create realistic tank movement and combat mechanics, supports in-game chat functionality and is regularly updated with enhanced graphics. Never played World of Tanks? The game has detailed tutorials with online multiplayer and in-game achievements. No timers, energy bars, or fuel-play as much as you want and whenever you want. "World of Tanks Blitz is a free-to-play mobile MMO action game developed by Wargaming, the award-winning online game developer and publisher of World of Tanks, the smash PC hit now with over 80 million players worldwide! Drawing inspiration from the PC version, World of Tanks Blitz is built specifically for optimal online mobile gameplay and is currently available on your iPhone, iPad and iPod Touch. With an impressive roster of over 90 massive tanks, stunning graphics, and intuitive touch-screen controls, World of Tanks Blitz makes it easy to jump into short, action-packed 7vs7 tank battles no matter where you are! A truly free-to-play game. No timers, energy bars, fuel-play as much as you want and whenever you want." Glu Mobile Inc. has released the highly anticipated Kim Kardashian Hollywood mobile game for both iPhone and Android platforms. As Kim's trainee, players must create your own star and customize your look with hundreds of style options, including her personal picks. Star in a huge interactive adventure as you encounter other celebs, dedicated fans, persistent paparazzi and even hang out with Kim herself. Rule the red carpet as an A-list movie actor, cover model, fashion designer. What you do is up to you, as you are in control of your stardom. The choices made within the game can have career altering effects. Bring your friends along for the ride using Game Center and Facebook and help each other rise to fame, compare styles, send gifts, to see who can be the biggest star. Kim Kardashian: Hollywood is free to play with micro-transactions. "Join Kim Kardashian on a red carpet adventure in Kim Kardashian: Hollywood! 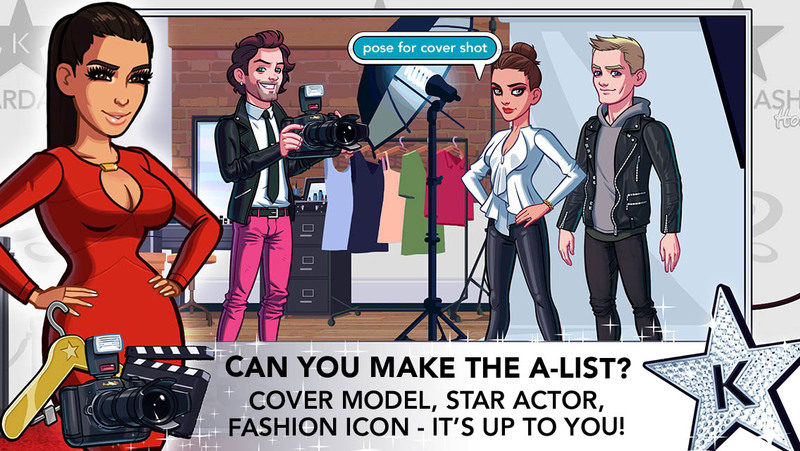 Create your own aspiring celebrity and rise to fame and fortune!" Across the Table - Hockey by Megalodon Interactive is a same-screen 2-player game that combines air hockey and table hockey. Imagine playing table hockey, with added speed and freedom of air hockey. If you're a fan of table and air hockey you should give this game a try with your tablet device. This game retails for $0.99 within the iOS store. "Arcade style hockey action is hitting the iPad! Across the Table - Hockey is a same-screen 2-player game that combines air hockey and table hockey. Imagine playing table hockey, but with the added speed and freedom of air hockey. This is a completely new way to play the world's coolest sport." "Across the Table - Hockey was built from the ground up for two players. We believe that true multiplayer games are meant to played in-person with your family and friends - whether it be at a coffee shop, cafeteria, or at home during game night. So grab a buddy, put your game face on and score some goals!" Aerena - Clash of Champions by Megalodon Interactive is a challenging, hero-centric combat game teeming with innovative features, revolutionary mechanics and jaw-dropping graphics. ÃRENA is an ever-changing battlefield, one that demands superlative strategy and tactics. It's the ultimate cross-platform, multiplayer battle arena game! In AERENA, a variety of Champions, Ships and Aether Shells are always available, allowing you to create and enhance your favorite team and lead it to victory in demanding tactical combat. This game is free to play within the iOS store. "Set in a unique Aetherpunk world in which powerful masters and their champions fight it out for control of valuable Aether, Aerena offers gamers a deep and variable strategic experience, packed into 10 minute play sessions. Plan your strategy, build your team, equip powerful Aether shells and outwit real-world foes to dominate the battlefield and become an Ether Master." Join in on the hunt for the elusive Allghoi. In MagisterApp's latest tap adventure, Butukhtu the hunter a leading expert in legendary monsters who's latest obsession is to capture a number of Allghoi and take them back to his laboratory for study. They keep escaping and you have to help them traverse 8 worlds to help them get home. This game deploys a classic flow style puzzle and a great game you can play wherever you are. Challenge your friends and other players in rankings that are updated in real time. This game is free to play within the iOS store. "Never heard of the Allghoi! Impossible! Some say they are legendary evil monsters from the Gobi desert, but the truth is quite different! After years of searching, Butukhtu the hunter, a leading expert in legendary monsters, manages to capture a number of Allghoi and take them back to his laboratory for study. Luckily, the lovable creatures manage to escape and set off on the long journey home." "This journey will prove very difficult indeed, unless you can help them find their way back to the Gobi desert. Allghoi VS. Hunter is a classic flow style puzzle and a great game you can play wherever you are. You can challenge friends and other players in rankings that are updated in real time." Arcane Ghosts bring the Classic Arcade Style gameplay to the iOS mobile platform. If you're familiar with Ghosts and Goblins then you'll tip your hat to developer Miguel Vivo Guzman, who does a great job of revitalizing a 2D side-scrolling platforming game in the iOS. Using fully customizable controls players can choose controls size, type and position. Fun, challenging and beautiful you have tons of weapons to waste, and plenty of monsters to punish them with. Arcane Ghosts works on newer devices including the iPhone 4, iPad 2, and the iPad Mini. This game retails for $1.99 within the iOS store. "Huge monsters, undead deities, hidden treasures. Arcane Ghosts is the 2D plat-former, inspired by the classics. The challenge that you were waiting for. Explore the levels, find keys, secret items, level up your character, acquire new abilities and beat the evil once and for all." Take Orestes to avenge the King and his brothers. Beat the dark Necromancer! Clean Greece from the legions of undead myths! Developer Copper Octopus delivers a fast-paced action, based on skill and strategy. Similar in gameplay to Metal Slug Defense; Armies of Monster Mountain uses real-time combat system between opposing fantasy armies with the objective of destroying each others . Deploying a wide range of troop types (Dragons, Gladiators, Undead, Samurai, Knights, Wizards or Mythical Creatures), your challenged to master and counter the enemy offensive. AMM has some decent fantasy visuals, animations for characters and environments that bring the battles to life. As a game of strategy, it's up to you to become a better general by improving your kill score and minimizing troop casualties. This game is free to play within the iOS store. "Battle your way past the opposing armies to be crowned champion of Monster Mountain! Take control of a faction determined to rule Monster Mountain by conquering all who lie before it. Play as either an army of Gladiators, the Undead, Dragons, Mythic Creatures, Samurai, Knights or Wizards. Only one can rule them all! Battle Bears Ultimate is a 4v4 multiplayer shooter by developer SkyVu Entertainment Inc. Organize your squad and join in this clan based adventure using four unique characters with their special abilities. Customize your character and do battle across five multiplayer maps with tons of weapons to unlock, upgrade and customize. Send Private Messages to your teammates to coordinate the ultimate attack. This game is free to play within the iOS store with micro-transactions. "Lead your clan to victory! Battle Bears Ultimate is an epic single & multiplayer FPS shooter game with amazing graphics! Experience the New Clan System, Crazy Cool Weapons, and Daily Challenges." Get to the choppa and show no mercy, developer Bulkypix Games offers a modern take on the vertical shoot'em up genre. Arcade machine buffs, fans of action and shooting games will be hooked. This game is free to play within the iOS store with micro-transactions. "More powerful than ever, the enemy has holed up on the Island of VylleÃ±a. And now it's up to you to track him down and destroy all hostile activity. An increasingly powerful arsenal of weapons is available for blazing a path through the enemy lines." Enjoy how a wonderful origami world comes to life with Paperama from FDG Entertainment, the same makers of Oceanhorn. Paperama is a new and unique puzzle adventure, where players fold paper sheets to create origami figures. You must work as accurately as possible to fit the form in the minimal amount of folds. This game is free to play within the iOS store with micro-transactions for hints. "Enter a beautiful Origami world and bring it to life!" If you're a fan of the SNK games you definitely want to check out The Rhythm of Fighters. This game is packed with legendary SNK tracks. Tap to your favorite tunes from Metal Slug, Samurai Showdown, King of Fighters and Fatal Fury. The Rhythm of Fighters features tons of fan-favorite tracks from many SNK's traditional game series such as The King of Fighters, Fatal Fury, Samurai Shodown, Art of Fighting, and Metal Slug, but also special arrangements of classics especially made for this game by their original composers. Moreover, The Rhythm of Fighters will be updated regularly with more and more nostalgic tracks! Unleash your favorite special moves and combos following the frenzied rhythm! Play to the rhythm of the music to make your character unleash fan-favorite moves and combos on the opponent! Take advantage of the "Rhythm Battle System" for astronomical scores! Let's enjoy the ultimate blend of rhythm & fighting game genres for a unique game! Â A game system that can be enjoyed by everyone! Game controls: With its user-friendly controls that allow you to tap anywhere on the game screen, "The Rhythm of Fighters" can be played and enjoyed by everyone! "